FedEx Corporation (FedEx Express) (Memphis) has announced it has permanently retired 15 aircraft and 21 related engines as it continues to rationalize capacity and modernize its aircraft fleet to more effectively serve FedEx Express customers. One McDonnell Douglas MD10-10 airframe and three related engines. The impact of retiring these aircraft, engines and related parts resulted in a non-cash impairment charge of $246 million recorded in May 2015. 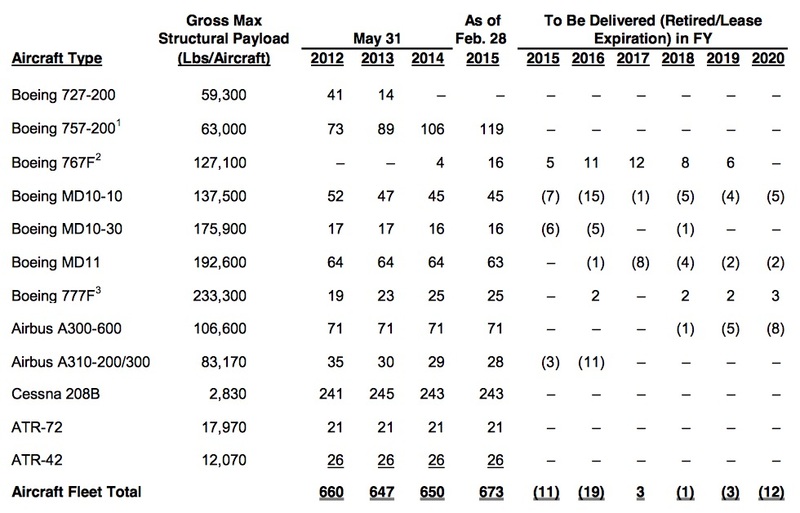 FedEx has also adjusted the retirement schedule of an additional 23 airframes and 57 engines. FedEx also recognized in May 2015 $30 million in cash charges associated with these actions. These combined retirement changes will not have a material impact on near-term depreciation expense. 1 – February 28, 2015 Boeing 757 count includes 21 aircraft that are not currently in operation, 5 of which are in the modification process and 16 of which are awaiting modification. 2 – As of February 28, 2015 Boeing 767 count includes 3 aircraft that are not in operation and are in the modification process. As of February 28, 2015, FedEx is committed to purchase 44 B767Fs. Aircraft to be delivered statistics include certain lease additions and expirations. 3 – As of February 28, 2015, FedEx is committed to purchase 18 Boeing 777Fs. Copyright Photo: Michael B. Ing/AirlinersGallery.com. Seven MD-11Fs were retired. McDonnell Douglas MD-11 (F) N595FE (msn 48553) climbs away from Anchorage. 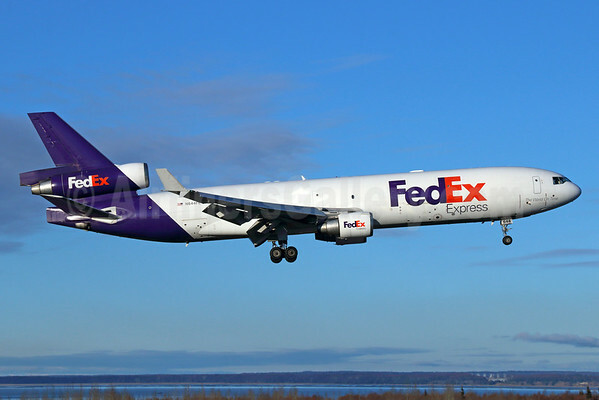 This entry was posted in FedEx Corporation, FedEx Express and tagged 48553, FedEx, FedEx Corporation, FedEx Express, FedEx Express aircraft, FedEx Express fleet, McDonnell Douglas, McDonnell Douglas MD-11, McDonnell Douglas MD-11F, MD-11, MD-11F, N595FE on June 2, 2015 by Bruce Drum. The Board of Directors of Finnair’s associated company Nordic Global Airlines Ltd (NGA) has decided to discontinue NGA’s operations by May 31, 2015. The termination of the operations has no material impact on Finnair’s cargo business, or Finnair’s financial position. NGA, focused on cargo freighter operations, was founded in 2011. Since then NGA grew to fly main-deck cargo in four continents with its low-cost and thin-organization model, but with overcapacity in the sector and depressed freight pricing, the cargo airline’s decision to cease operations was unavoidable. Finnair Cargo Oy owns 40 percent of the company, and other shareholders are Neff Capital Management LLC, Daken Capital Partners LLC and the Mutual Pension Insurance Company Ilmarinen. Between 2011 and 2014, Finnair leased freighter capacity from NGA for its mainly Asian cargo traffic. Finnair’s belly cargo capacity will increase significantly in the coming years, when new A350 aircraft join Finnair’s fleet. Finnair has decided to focus in future on cargo carried in the cargo holds of passenger aircraft and discontinued separate cargo freighter operations at the end of 2014. NGA was operating four McDonnell Douglas MD-11F freighters. Copyright Photo: Paul Bannwarth/AirlinersGallery.com. Despite the elaborate NGA logo, the NGA aircraft usually operated with only small titles and non-descript white fuselages. McDonnell Douglas MD-11 (F) OH-LGD (msn 48513) arrives at Las Palmas in the Canary islands. This entry was posted in Finnair, Nordic Global Airlines-NGA and tagged 48513, Daken Capital Partners LLC, Finnair, Las Palmas, LPA, McDonnell Douglas, McDonnell Douglas MD-11F, MD-11, MD-11F, Mutual Pension Insurance Company Ilmarinen, NGA, Nordic Global Airlines, Nordic Global Airlines Ltd, Nordic Global Airlines-NGA, OH-AFJ on May 8, 2015 by Bruce Drum. Air France-KLM Group (Air France, KLM Royal Dutch Airlines, Transavia Netherlands, Transavia France, Hop! and Martinair) reported a first quarter net loss of €504 million ($56.9 million), compared to a net loss of €485 million ($546 million) in the same quarter a year ago. Copyright Photo: Ton Jochems/AirlinersGallery.com. 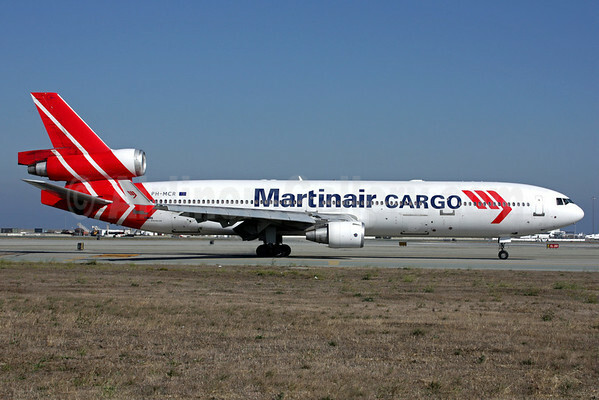 The group retired three Boeing 747 freighters in the Winter 2014-15 season, while another five Martinair McDonnell Douglas MD-11s will be retired by the end of the Winter 2015-16 season. The Group plans to operate only five full-freighters by the end of 2016. McDonnell Douglas MD-11 (F) PH-MCS (msn 48618) of Martinair taxies at the Amsterdam cargo hub. This entry was posted in Air France, Air France-KLM Group, KLM Royal Dutch Airlines, Martinair and tagged 48618, Air France, Air France-KLM Group, AMS, Amsterdam, KLM, Martinair, McDonnell Douglas, McDonnell Douglas MD-11, McDonnell Douglas MD-11F, MD-11, MD-11F, PH-MCS on May 1, 2015 by Bruce Drum. EVA Air (Taipei) today (March 23) operated its last McDonnell Douglas MD-11 flight. The pictured MD-11F B-16113 (msn 48790) departed Taipei (Taoyuan) at 0840 local time as EVA Air Cargo flight BR 606 to Anchorage. EVA Air was the last operator of the tri-jet in Taiwan. China Airlines and Mandarin Airlines previously also operated the type. EVA Air operated the MD-11 as a passenger aircraft from 1992 through 2003 and was down to just the one MD-11F freighter for today’s retirement. 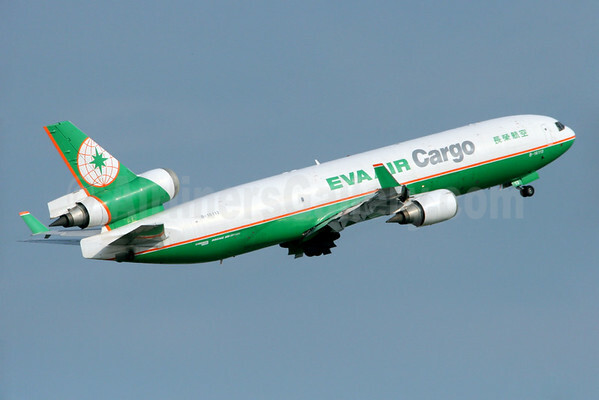 EVA Air Cargo continues to operate the Boeing 747-400 freighter. EVA Air is considering adding the more efficient Boeing 777F freighter in the future. In other news, EVA Air on June 19, 2015, EVA Air will be launching new nonstop passenger flights to Houston (Bush Intercontinental) (IAH). Copyright Photo: Manuel Negrerie/AirlinersGallery.com. B-16113 departs from Taipei (Taoyuan). This entry was posted in EVA Air, EVA Air Cargo and tagged 48790, B-16113, EVA Air, EVA Air Cargo, McDonnell Douglas, McDonnell Douglas MD-11, McDonnell Douglas MD-11F, MD-11, MD-11F, Taipei, Taoyuan on March 23, 2015 by Bruce Drum. Martinair Cargo (Amsterdam) will scale back its freighter fleet by June 2016 and will continue as a freighter operator for the Air France-KLM-Martinair Cargo group using three Boeing 747-400 ERFs and a Boeing 747-400 BCF. 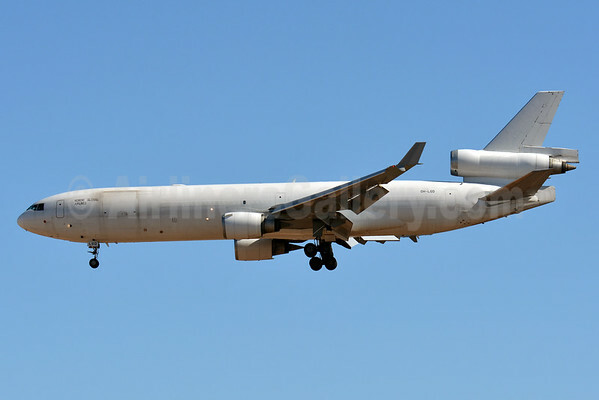 This means the remaining McDonnell Douglas MD-11F freighters will be phased out. The company has reached this decision after a thorough deliberation with all the parties involved. Air France-KLM-Martinair Cargo group has decided on a business model which requires less freighter capacity, rather than a model with no freighters at all. Consequently, as an operating carrier within the KLM Group, Martinair Cargo will scale back its fleet and use just one type of aircraft (Boeing 747). This decision affects around 170 ground staff FTEs in the Netherlands, 50 FTEs abroad and 110 cockpit FTEs. From 2016, Air France-KLM-Martinair Cargo will continue to operate with a main frame fleet of six Full Freighters (two Boeing 777Fs at Paris Charles De Gaulle and four Boeing 747-400s at Amsterdam Schiphol), supplemented by 15 Boeing 747 Combi’s. 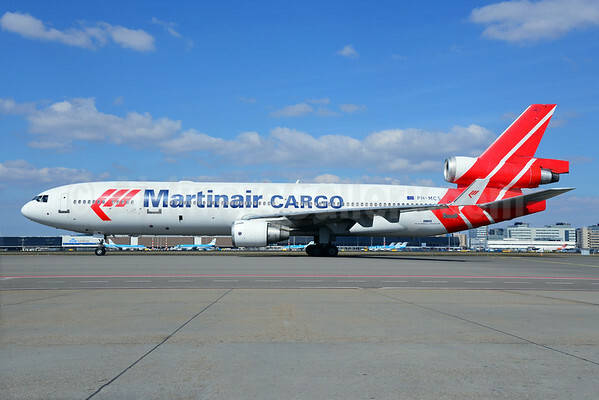 Air France-KLM-Martinair Cargo is convinced that the remaining flexible freighters will continue to provide its clients with a full range of solutions to meet their needs. The freighter network at Schiphol will concentrate on Africa and North, Central and South America and will, of course, continue to serve important markets, such as the flower sector. The company will also continue to invest in Cargo (Express, Pharma, e-commerce). Copyright Photo: Mark Durbin/AirlinersGallery.com. McDonnell Douglas MD-11 (F) PH-MCR (msn 48617) is pictured at San Francisco International Airport (SFO). This entry was posted in Air France, KLM Royal Dutch Airlines, Martinair and tagged 48617, Air France, KLM Royal Dutch Airlines, Martinair, McDonnell Douglas, McDonnell Douglas MD-11, McDonnell Douglas MD-11F, MD-11, MD-11F, PH-MCR, San Francisco, SFO on March 18, 2015 by Bruce Drum. Finnair (Helsinki) is getting out of the dedicated freighter business by the end of this month according to ch-aviation. The Finnish carrier will depend on belly cargo in the future using its own passenger aircraft. 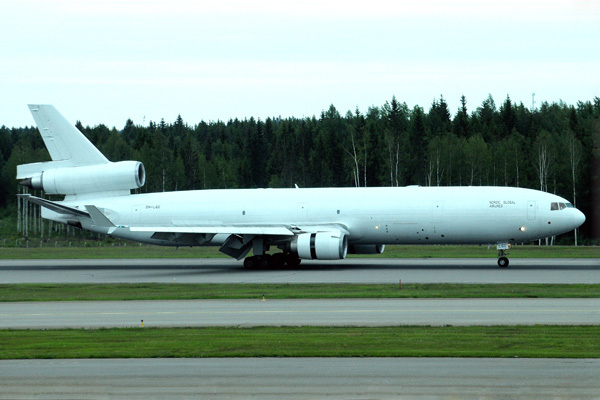 Currently its dedicated freighter operation is provided by partial owned (40%) Nordic Global Airlines (NGA) which operates four McDonnell Douglas MD-11F freighters mainly for Finnair. It is unclear if NGA will continue to operate its ACMI operations after Finnair stops all dedicated freighter operations. Nordic Global Airlines Ltd (NGA) is a Finnish all cargo carrier based in Helsinki-Vantaa Airport, Finland. NGA focuses on ACMI and Cargo Charters worldwide and operates under EASA AOC. NGA has a highly dedicated and experienced team to manage the operations. As a young and dynamic company we are able to deliver the right ACMI and Charter services to our customers. At the beginning of 2014 NGA operates a fleet of four MD-11F freighters for long-term ACMI customers and on ad-hoc charter basis. Since the commencement of the commercial operations in August 2011 NGA has performed more than 2,000 flights to our customers satisfaction. Copyright Photo: Marco Finelli. Former Finnair McDonnell Douglas MD-11 (F) OH-LGC (msn 48512) wears only small Nordic Global Airlines titles at its Helsinki base. This entry was posted in Finnair, Nordic Global Airlines-NGA and tagged 48512, ACMI, Finnair, HEL, Helsinki, McDonnell Douglas, McDonnell Douglas MD-11, McDonnell Douglas MD-11F, MD-11, MD-11F, NGA, Nordic Global Airlines, Nordic Global Airlines-NGA, OH-LGC on December 5, 2014 by Bruce Drum. FedEx is expanding solutions for global customers who need their critical deliveries to arrive as early as the start of the next business day. This expansion brings the total number of origin markets to 97, and means that customers can now use FedEx International First to ship packages from the above countries to any of the existing International First destination markets. FedEx International First is a time-definite, customs cleared, door-to-door express service with a pre-defined delivery commitment for shipments up to 150 lbs. per package. Customers receive International First deliveries as early as 8 a.m. in the United States, 9 a.m. in Europe, and 10 a.m. in Asia, Canada and Latin America. While the range of shipments is broad, it’s often the delivery service of choice for customers shipping time-sensitive materials. Copyright Photo: Michael B. Ing/AirlinersGallery.com. McDonnell Douglas MD-11 (F) N644FE (msn 48444) lands in Anchorage. 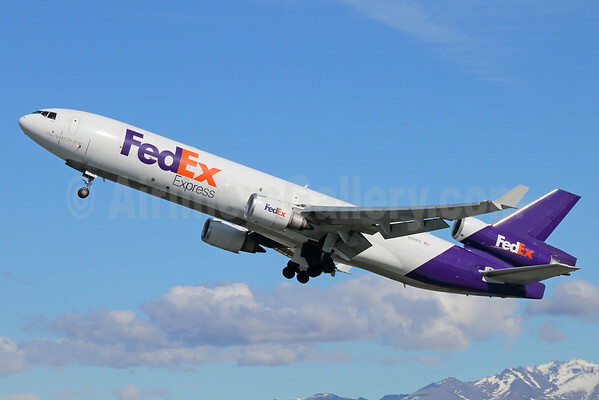 This entry was posted in FedEx Corporation, FedEx Express and tagged 48444, ANC, Anchorage, delivery service, FedEx, FedEx Corporation, FedEx Express, FedEx International, FedEx International First shipments, International First, International First destination markets, McDonnell Douglas, McDonnell Douglas MD-11, McDonnell Douglas MD-11F, MD-11, MD-11F, N644FE, Ted Stevens Anchorage International Airport on October 28, 2014 by Bruce Drum.